This post is about two things. First, why you need to constantly be reinventing yourself. And two, why you should get a new book from Harvard Business Review Press on that very topic. You know that the days of lifelong employment are long gone, right? The stark truth is this: there is no guarantee that your job, your company, or even the industry you work in, will exist a decade from now. In fact, it’s worse than that. The odds are almost certain you will be displaced. I recently wrote about the IBM survey of CEOs. When asked what kind of skills they look for in new hires their answer was: skills? Nobody knows what skills will be needed five to ten years from now. CEOs hire people who are adaptable and lifelong learners. The only way to survive and indeed thrive in the new, hypercompetitive global economy is to constantly reinvent yourself. And by the way, you know how they say, “dig your well before you’re thirsty.” Well, reinvention is kind of like that. Ideally you don’t want to do it after you’ve been laid off. That’s the whole point…take control, be proactive, re-invent. Which brings me to a great little handbook to help you do just that. Dorie Clark is the “da bomb” when it comes to marketing and communications. She has taken her own experiences with reinvention and turned it into a fun, readable book. 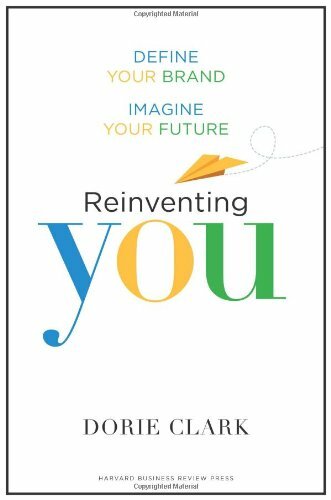 Among other things, Dorie writes about how to really understand your current situation and what others think about you, how to develop new skills, how to find mentors, how to leverage your unique points of difference, how to build your narrative (my favorite chapter! ), and how to introduce the “new” you to the world. This is a really practical book with lots of “do it” exercises, but also very entertaining. You’ll read the reinvention stories of a lot of everyday people, but also the stories of folks like Tim Ferriss, Mark Zuckerberg and Al Gore. Hope you’ll check it out here.